The music is harp like. This movement is quite different than other musical movements and here's why. The music is being played on two 50 note combs rather than just one. The movement uses two cylinders at once to accomplish this task. What is really unique is that I can adjust the comb on the right side of the movement to make it a little louder and the left comb can be adjusted to be a little softer. This will cause the music to take on an antiphonal effect. You can hear the two combs answering each other. The one on the left being just a little bit softer, while the one on the right will be just a little louder. Many of the antique music boxes were made to do exactly this. So far as I know, this art has not been produced from the past, that is, not until now. Forget about hand-bell choirs. Get this movement instead. This is unquestionably Sankyo at their best. It's Happened At Last! Sankyo has made a big step up in the music box industry. I am talking about the 100 note movement. Yes, it's finally here! 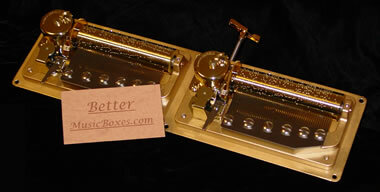 This movement is so rich that it reminds me of the antique music boxes of yesteryear. 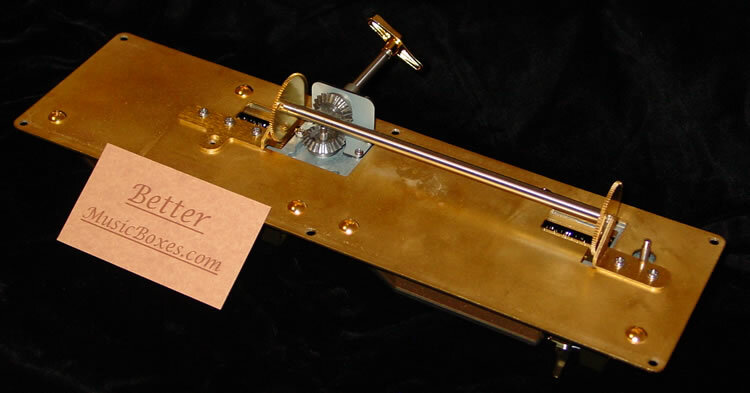 This movement uses two 50 note combs as well as two 50 note cylinders to play its tunes. At the present time Sankyo is calling this 100 note movement the "Concerto Series". When we learn of new tunes we will add them as soon as we can to our tune list. I can tell you this: it looks like Sankyo is going to be building larger movements than we have been seeing before. If this particular series proves to be successful (and I am sure that it will) all of us can expect greater improvements in the music box industry. For those who want to make their own music boxes, this 100 note will provide the means for the wood worker to construct an antique style music box. What a great time this is. I'm only too glad to be a part of this venture. Playing time is usually about 6 minutes. What Does Sublime Harmony Antiphonal Mean? Have you ever been in a large room with a choir? Two groups of singers are having a conversation. The first group will be in front of the room, and the second group will be in back of the room. Suppose that this group in front says, "How are you?" The group in the back answers them and says, "I am fine." This is what the 100 note movement is doing. I think that you will find this Antiphonal effect most lovely. On 100 Note Movements during our Bell-Like Tuning, I adjust some pitches to produce Sublime Harmony tuning. Similar to a 12-string guitar, this tuning results in a celestial, richer, fuller, heavenly sound. The music itself is like a sublime harmony box from the past. I like it better than the 144 note movement that Reuge is making today. Our in-house comb machine and Rick's expertise result in Bell-Like Tuning unrivalled in new movements for decades.